The rocking town of Sevierville goes first, on November 7, with fun at the Municipal Complex, starting at 3 pm and ending at 8 pm with a spectacular fireworks show finale. There will be face-painting for kids, along with balloon animals and even a whole balloon show. Get your camera ready as Santa appears at 4:30 for pictures with the kids. And courtesy of Dixie Stampede, Jimbo Whaley & Greenbrier will give a special performance. Oh, and the lights will go on, reaching as far as along the highway to Interstate 40, in Sevierville’s usual warm welcome to visitors to the Smokies! 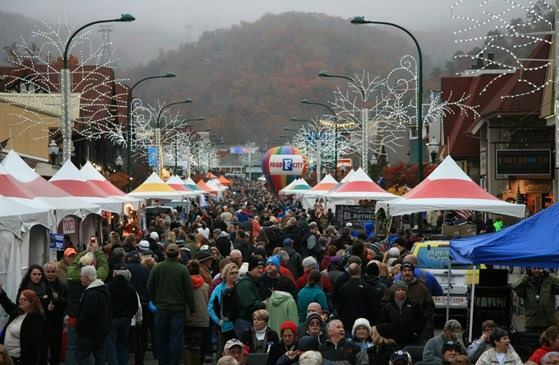 Get some sleep because the next day on November 8, Pigeon Forge starts running up its utility bill with more than 5 million lights decorating the town, and a party in Patriot Park for the 27th Annual Winterfest Kickoff. The Children’s Games start at 4 pm, and at 5:15 the lights turn on, immediately followed by a fireworks show – when the fireworks end, somehow the lights continue, and for the next few months to come. Jimbo Whaley & Greenbrier – hopefully rested from the day before – appear again on stage at 5:30 pm for a live show. The Trolley Tour of Lights – supported by Pigeon Forge and Gatlinburg alike – begins for the season here in the park with a complimentary evening tour. The trolley is the way to see the lights, and nothing signals the time of Christmas and winter fun like a trolley tour. Ready for Gatlinburg? It’s all happening on Wednesday, November 9, as the town celebrates its 27th Annual Winter Magic Kick-Off and Chili Cook-Off between 5 and 9 pm in downtown on Parkway. Music will take the stage at traffic light #6, with Greenbrier – rested we hope from the previous 2 days – starting at 5 pm. and playing throughout the evening, interspersed with the main acts. Headliner Tara Thompson performs at 6:15, with Grassabillies opening at 5:15. The lighting event will occur at 6 pm, and 3 million lights, including some really sharp LED animated displays, will light up Gatlinburg for its signature Christmas look. Throughout all these proceedings, the smells of a vast array of chili recipes will fill the air, as more than 25 local eateries and vendors compete for the best of the best, with chili contests at 5:30 and 6:30 pm. The whole event is free, but chili sampling costs $10 per ticket – and this is for unlimited sampling until everything is gone! In each town the kick-off event is a prime feature. Three in a row spells something special. And that’s the Winterfest magic. It’s turning festive now, in an area that likes to have fun, and it’s not going to stop all winter! TIP: for an insider guide to all the great things to see and do during this festive season in the Smoky Mountains, check out our write-up in our Things To Do section: Winterfest and Winter Magic.